Worldpeacefull Empowerment (WE) training is based in Melbourne available nationally and worldwide. Worldpeacefull Empowerment training is tailored to the work, health and safety guidance material of each State and within the context of national themes. The introductory video features Susan Carew, the Principal of Worldpeacefull Empowerment (WE) training (formerly Workplace Bullying Training Unit). The prevalence rates have implications for the business community in relation to the cost to the business community, industry costs, corporate costs and personal costs for individuals if workplace bullying is not addressed. The opportunity cost for business is the cost of not taking action. As highlighted below, doing nothing is a high cost. Below are estimates of the opportunity cost of not preventing bullying in the workplace. The financial cost of workplace bullying to business in Australia is estimated to be between $6 billion and $36 billion a year. This includes indirect costs, such as: absenteeism, labour turnover, loss of productivity and legal costs. It can cost a company approximately on average $20,000 per employee as a result of serious bullying. Other statistics identified in the House of Representatives Standing Committee on Education and Employment Inquiry on ‘Bullying: we just want it to stop’ indicated the costs were on average between $17,000 and $24,000 (inclusive of direct and indirect costs). Thus a midpoint estimate of $20,500 per employee. Stephen Covey the author of the Seven Habits of Highly Effective People recommends – Seek First to Understand Then To Be Understood. This underlies the approach of WE research and training. Worldpeacefull Empowerment (WE) training can assist your business in reducing your exposure to fines through non-compliance with WorkSafe guidance on workplace bullying and help prevent the significant human costs of destroyed careers and personal lives through accurate research and targeted training. A detailed workplace bullying climate survey will provide management with the insights needed to determine the incidence of workplace bullying, the level of awareness of WorkSafe criteria, the emotional disposition of staff, awareness of internal processes, procedures, policies and training needs. The aim of all the workshops is to empower staff with tools to resolve conflict (inner and outer) and to work towards building a harmonious environment where people take responsibility for conflict and harmony at work. The logo of the WE training represents the masks of the happy/sad face that symbolically conveys that the risk is often masked behind smiling faces. Life and work can be perceived as a funny business (satirically), where you either laugh or cry. 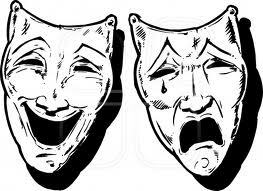 It is not dissimilar to the happy/sad clown face often depicted in the arts and literature. When everyone is getting along at work it can be uplifting, fulfilling and exciting to go to work and be part of a team with a purpose. This is what harmony feels like. However, the flip side is that often in workplaces there are covert and overt negative behaviours projected as professional yet masking: insecurity, aggression, fear and powerlessness. When negative behaviour is repeated by a person or group overtime it becomes a risk to an individual’s health and safety, it is then identified as bullying. The difficulty with this type of risk to health and safety is that it is psychological, thus invisible or subtle and often people feel unable to fight it. 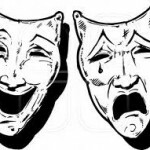 This is what creates the feeling of: uncertainty, the dread of going to work, the fear of conflict and the sense of powerlessness that can pervade so many workplaces often behind the mask of smiling faces. We seek to mask ourselves so that no-one knows. We smile professionally and hide the pain when feeling overwhelmed and uncertain. Worldpeacefull Empowerment training offers a diversity of workshops to tailor and deal effectively with conflict and to transform negativity into wellbeing. Sometimes we take ourselves seriously, thus, the training programs all have a positive/humorous component to make learning and exploring ourselves interesting and positive. All problems are challenges in disguise and with a willingness for co-operation and harmony, there are no problems that are a intractable, therefore it is to find solutions that work. WE will provide your organisation with a workplace bullying risk assessment of workplace bullying. This information is collected by online confidential survey administered to all staff to determine the incidence of workplace bullying. The information is confidential to WE training to ensure that staff trust is gained to ensure a clear snapshot that is useful for managers, human resources and OH&S officers. Management will gain information on covert and overt bullying, harassment and violence. Management will receive information on the level of staff awareness about what bullying is, the incidence, witness rates, awareness of policies and procedures, feedback on where to go for help and complaints handling with satisfaction levels. The research will provide insights into emotional wellbeing and how staff perceive their organisational culture. It has clear and targeted questions to assist your organisation in gaining a clear overview of the workplace bullying climate. In addition the research will determine if there are any gaps in training and what training is actually required so that it is targeted providing value for money. The report generated can be utilised to show that work has been done on ensuring compliance with aspects of WorkSafe guidance and complying with the duty of care for employees in a safe workplace. The risk assessment can be expanded into desk research to look over policies, internal statistics on e.g. staff turnover, stress leave, absenteeism etc. Moreover, observational research can be conducted to observe the workplace dynamics (to observe people at work). Qualitative focus groups can be utilised to ascertain the deeper emotional issues that cannot be seen and advice that employees would offer to tackle complex issues. So there are a range of research tools your organisation can use to understand this issue within a proactive context. The Workplace Bullying and Occupational Violence workshop provides up-to-date information on bullying, the incidence, costs, legislative implications and WorkSafe guidance. This workshop is a briefing or a half day workshop to provide experiential training o about bullying. There are considerable gaps in the understanding of bullying therefore Getting Clear on Defining Bullying has been developed to help both staff and management understand where to draw the lines between bullying and management. One of the key features of those who bully is a lack of empathy and disconnection from positivity. The Laughter, Empathy and Anti-bullying workshop has been designed to bridge that gap and to introduce staff to an understanding and feeling of empathy and the importance of positive humour in the de-escalation of conflict and lighter attitudes in the workplace. The workshop includes communication and conflict resolution to reinforce how to to deal with conflict effectively. Positive humour is powerful in lightening up the situation and decreasing seriousness which can polarise positions. Workshops cover: management coaching, values, conflict resolution, communications, creative thinking, assertiveness, building empathy, personal inquiry (beliefs), conflict triangles and skills in harmonious team building to deepen skills and a broader understanding of how to develop and maintain harmonious workplaces. These workshops are essential in addressing workplace bullying and educating in peaceful attitudes and behaviours. Moreover, the workshops raise awareness and empower employees to take action. Without wellbeing conflict resolution in all its aspects is not effective overtime given the negativity that drives bullying in terms of low self esteem and powerlessness in both the target and bully. The wellbeing workshops are designed to de-stress staff, build the team in fun, frivolity and enthusiasm. Workshops facilitate the art of play exploring the child within. Staff learn work/life balance, juggle to develop concentration, personal and community happiness and laughter workshop. Madan Kataria is famous for his laughter yoga practice which spread to more than 6,000 laughter clubs worldwide refer http://en.wikipedia.org/wiki/Laughter_yoga His laughter yoga process inspires organisations to live, laugh and be happy. As a World Peace Clown in Russia with Dr. Patch Adams I discovered the importance of laughter and play in building teams, emotional feeling and through positivity seeing others in a different light. It is excellent for health and wellbeing. Wellbeing enlightens the organisation to embrace workplace harmony and problem solving, this is where the real wealth of the organisation is generated and often not recorded on the balance sheet. Cooperation, happiness, enthusiasm and creativity are the values that build innovation and a competitive advantage. When employees don’t give up on the organisation and feel motivated to do their best work then the organisation will benefit in ways that are off the charts. Happier employees work efficiently and effectively to meet client needs, they communicate politely, they support other staff members, they mentor to help new people, they talk to others about the incredible company they work for and they can’t wait to go to work. Even in workplaces that are rote in terms of processes, if there is a focus on community, then workers will enjoy work. What is identified here is really a changing social contract between business employers and employees, where both seek to give their best for the betterment of all. There have been exciting examples of innovative workplaces highlighted by Richard Branson’s creative approach to business (refer http://www.entrepreneur.com/author/richard-branson) and Ricardo Semler, the famous Brasilian entrepreneur who developed innovative business management policies to motivate and encourage greater participation from employees (refer http://www.strategy-business.com/article/05408?pg=all). Wellbeing is the flagship for organisations who really want to succeed and be world leaders. Our world is changing and wellbeing is central to success. Susan Carew is the Principal of the Worldpeacefull Empowerment training is The Workshop Presenter. She has extensive experience in economics, market research, peace and conflict research, conflict resolution and emotional intelligence. Susan has a degree in economics and was the manager of Independent Research conducting quantitative and qualitative research. She has been a consultant to industry at the Enterprise Institute of Australia (later Institute of Company Directors). Susan studied Peace Studies at La Trobe University, Melbourne. This was a unique Peace Studies program convened by Dr. Tom Weber an international expert on nonviolence, specialising in Mahatma Gandhi’s principled and transformative approaches. The program included training in Alternative Dispute Resolution (ADR) e.g. mediation and canvassed human rights and international relations conflict issues. Susan won a Rotary scholarship from a worldwide candidacy to study peace and conflict at the prestigious Chulalongkorn University, Bangkok, Thailand. She studied both live practical and theoretical cases. The students chosen were engaged in mediation, law, policing, psychology, religion, peace education, nonviolence and the media. They came from all over the world offering diverse skills and perspectives from their professional backgrounds. In addition, Susan developed her nonviolence training with the very effective Alternatives to Violence Training which is utlised in prisons and community building to reduce violence and educate citizens understanding the roots of violence. She trained as an advanced facilitator. Her particular interest in peaceful transformation which focuses on the empowerment of people to transform their own conflict and to recognise where behaviours are arising from. This is where power issues are addressed and resolved. The focus on wellbeing is the most important skill she learned travelling to Russia with Dr. Patch Adams the famous clown doctor (played by the late Robin Williams in the film). Mental health issues arise from suppression of emotions and holding onto stress which develops into anxiety and a range of psychological dysfunctions. She teaches clowning and juggling as a means of rebalancing the left/right hemisphere of the brain and releasing tension. Spontaneity is a lost art and essential for creativity and innovation. Therapeutic interventions of laughter and humour coalesce team building and personal wellbeing. This aspect of her work develops resiliency, emotional intelligence and builds community. Did you know that bullying has a long history that is normalised in society as ‘toughening people up’ or discarding them. You may recall bullying in your family, then at school, at work and in the community. It is both a conscious and unconscious behaviour whereby one party seeks to gain power over another. That is the core essence. Bullying can be a daily interaction. Have you ever bullied others? Do you understand the impact of bullying on people’s lives? Are you aware of psychological injury? Is bullying physical jostling, pushing, abuse and physical violence? Do you know about covert bullying? Are you aware about sexual harassment as both overt and covert behaviours? Are you aware that labelling victims and perpetrators distracts from solving the problem? In reality all people have been both the target of bullying and actively engaged in bullying in one form or another. Therefore, it is helpful to focus on the dynamics of bullying and sexual harassment and investigate the drivers. Can we totally stop bullying? No – not at this time because people believe they are power-less and are grabbing for power in any way that works. Those actively bullying can remain in denial for years, surround themselves with glee clubs believing it is normal or strength or they may not be pulled up by colleagues or management around them. They are unconscious as they do not know what they do. If they did, they wouldn’t do it. The role of training is to awaken them to what it is. If they can’t feel empathy then it is to guide them to think it through. We can use conflict, bullying and harassment in a empowered way to learn about ourselves and develop resiliency, personal empowerment and cultures of wellbeing (peace) where we realise that we unwittingly attract negative and harmful events into our lives. Does that mean it is our fault? No, we don’t realise we are doing it. We are ignorant of ourselves – our underlying motivations, emotional needs and power dynamics. We are in confusion. There is an invisible reality to bullying which happens in the unseen power games between people and lessons they need to learn about their own sense of self worth and empowerment. I wanted to end my life many times when I was covertly bullied and I discovered that when I suffered I agreed with the other that I had no power or worth. I gave my power away. This became the realisation that I had to find my own worth and power. The suffering stopped when I no longer believed in my own powerlessness. This is a central understanding to bullying and sexual harassment. This is not widely understood at this time as we think force, fines and legal action stop bullying, yes it is a deterrent but the legal system is not equipped to deal with the deep an complex psychological issues. It will prevent it through penalties as organisations respond to financial loss. This work is to resolve it and facilitate true happiness. Happy people do not bully. That is why your happy destiny is unavoidable when empowerment is your goal. My real hope is to expand awareness and skills to effectively deal with this problem that costs the business community up to $36 billion. If you would like to learn how to empower yourself and/or team/organisation and transform conflict into empowerment, I can guide you as I have experience. Dealing with bullying is not a theoretical/intellectual exercise. I have been personally bullied and sexually harassed and I have investigated this phenomenon for nearly 20 years. I used my own experience to understand what can’t be seen and often it cannot be articulated as it is not understood. Therefore, it can’t be easily proven in courts of law. It has to be dealt with within the psyche of each person and embedded in policies at the organisational level. I have been working out power dynamics and how to turn it around. I found answers. This is my personal purpose in life as I dreamed I was teaching peace in 1998 and have dedicated my life to peaceful transformation ever since. I have investigated peace and harmony from every possible perspective and after all this time I am gaining awareness of what it really is. We can’t eradicate it fully but we can transform it into empowerment. We can come eventually to feel gratitude for it. I learned this and haven’t looked back. I now accept my experience and will use it for the good of others. I am available to share what I know with the community as my own service to society.